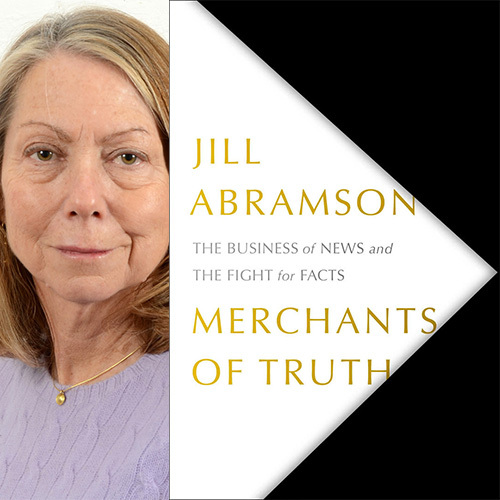 NPC Headliners Book Event: Jill Abramson - "Merchants of Truth"
Award-winning journalist Jill Abramson, former executive editor of The New York Times, will deliver an insider’s look at the transformation of journalism and the business of news at a Headliners breakfast conversation on Feb. 14 at 9 a.m. in the National Press Club’s Fourth Estate Restaurant. Doors open with a light breakfast of assorted pastries, coffee and tea at 8:30 a.m. The program will begin promptly at 9 a.m.
Tickets cost $10 for members and $15 for non-members. When purchasing your tickets online, you will also have the option of purchasing a book upon check-out, which will be available for pick up and signing at the event. Copies of the book will also be available for purchase at the door. The book, using the examples of two legacy heavyweights, The New York Times and The Washington Post, and two digital upstarts, BuzzFeed and Vice, dissects the disruption of the news media, its attempts to adjust and its uncertain future amid President Trump’s war on the press. Abramson, who witnessed the struggles firsthand in senior editorial positions at the Times and the Wall Street Journal, gives readers insight into the biggest players in media, including Jeff Bezos, Marty Baron, Arthur Sulzberger, Dean Banquet, Jonah Peretti and Shane Smith. Proceeds from the book sales will benefit the National Press Club Journalism Institute, the non-profit affiliate of the National Press Club, so the Institute asks that you leave all outside books at home.